This USB 3.0 Multi-Function Adapter is a product in between a docking station and an adapter. It has many flexible applications and is cost effective. With HDMI or VGA video output, the adapter enriches the user’s experience. The bus-powered design is convenient for travelers, and does not require the users to purchase another power adapter. 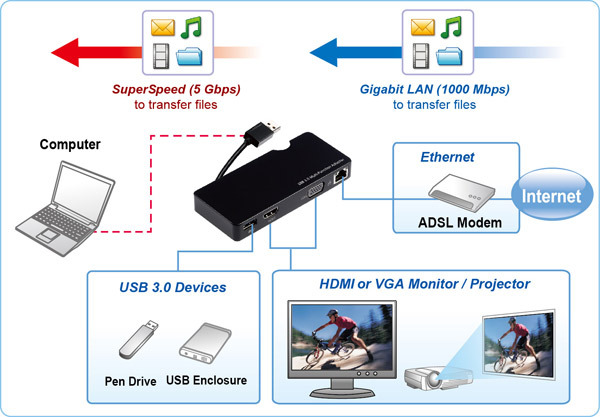 By including an RJ45 Ethernet port, gigabit network can be accessed through the USB port. Overall, it is a powerful and user- friendly product. Gigabit Ethernet port, support 10/100/1000 Mbps data transfer. NOTE: When connected to both the HDMI and VGA monitors, the docking station will automatically switch to the HDMI monitor, and disable the VGA monitor. NOTE: When connected to both the HDMI and VGA monitors, the adapter will automatically switch to the HDMI monitor, and disable the VGA monitor. NOTE: When connected to USB 2.0 port of PC/NB, the adapter may not function properly for the limited power supply. Make sure the connected host is compliant with the USB 2.0/3.0 specification. *Specification is subject to change without prior notice.